"In terms of tertiary studies, I learned Old Testament from 'extreme liberals' as well as 'moderate conservatives.' Then for years I felt satisfied that, although by no means a specialist, I had worked out a sensible approach to the Old Testament that was authentically Christian while avoiding the pitfalls of fundamentalism, marcionism and liberalism . . . especially with regard to the Book of Genesis. Read other reactions to Alice's research here. The bulk of my research focuses on the first quarter of the book, material that is often dismissed as non-historical or simply ignored. Using the tools of cultural anthropology, I'm working to uncover antecedents of the religion and social structure of Abraham and his ancestors. This involves looking for anthropologically significant data and analysis of the Genesis king lists. The oldest culture traits are those that are the most widely diffused geographically among the rulers in Haplogroup R1. Among this dispersed peoples we find the same artifacts and religious practices that suggest a common ancestry. To understand the Bible we must look for patterns that first appear in Genesis. In this sense, Genesis is the foundation to a proper understanding of the whole Bible. Often the patterns are more evident when we focus on the women because blood lines were traced through the mothers as well as through the fathers. So it is peculiar that the mothers of some of the most important male figures are not named in the Bible: Abraham's mother, David's mother, etc. The Genesis king lists in 4, 5, 10, 11 25 and 36 are important because they help us to understand the Bible's purpose. From beginning to end, the Bible is about the royal-priest ancestry of Jesus, who Christians believe to be Messiah, the Son of God. It is possible to trace His ancestry because of the cousin bride's naming prerogative, whereby the cousin wife named her first-born son after her father. This is why there are multiple rulers with the same name. There is Lamech the Elder, who bragged to his two wives, and his grandson, Lamech the Younger, the first-born of Methuselah by Lamech's daughter, Naamah. There is Esau the Elder and his grandson, Esau, the brother of Jacob. Esau the Elder was a contemporary of Seir the Horite (Gen. 36) and their lines intermarried. Esau the Younger, Jacob's brother, married Seir's great-great granddaughter, Oholibamah. 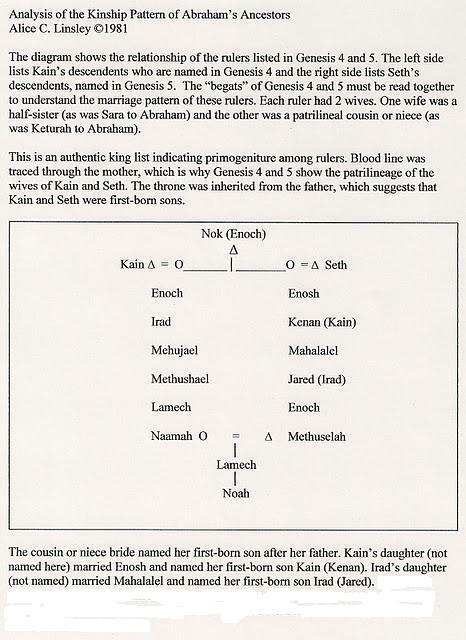 The cousin-bride's naming prerogative is found from Genesis 4 to Numbers and beyond, so it is not coincidental, but characteristic of the unique marriage and ascendancy pattern of the rulers of Abraham's people. Scholars like Noth, Albright, Speiser, etc. concluded that Genesis 4 and Genesis 5 represent different oral or textual traditions of the same ruling line. However, this is NOT what the Bible claims, and I take the Bible's claims seriously. The rulers listed in Genesis 4 are the descendants of Cain and those listed in Genesis 5 are the descendants of Seth. These lines intermarried As shown in the diagram below). The connecting link is Naamah, the only woman named in the kings lists of Genesis 4 and 5. The cultural patterns of the ancient Afro-Asiatic Semites and the Horite Hebrew caste are presented in Genesis more explicitly than in any other text. Reading the text through the lens of anthropology help us to identify significant data and to interpret it empirically, removing a great deal of speculation. This is where my theology is rooted. At a young age I was exposed to different cultures. This marks the beginning of my fascination with customs, artifacts and beliefs, a fascination that would later take me into the study of Anthropology. Much of my Genesis research draws on the disciplines of Anthropology, especially kinship analysis. I have experienced societies in the Philippines, Spain, India, Thailand, Iran, Greece and many parts of the USA. At age 8 I visited the headhunters in the mountains of Luzon and even have a photo of my 6-foot tall father standing next to the 4-foot spear-carrying chief of the village. I attended Catholic Mass in a pew-less village church with a hard-packed dirt floor with chickens scurrying about our feet. As an adult, I studied two tribal groups while living in Iran and attended Divine Liturgy at the Armenian cathedral in Jolfa (Isfahan). I explored Orthodoxy again in Greece where I observed the Divine Liturgy and visited the Icon Museum in Athens. "Don’t modify anything from your father’s [ancestor’s] teachings/instructions—not even a single word. And let this principle be the cornerstone for teachings to future generations." Mircea Eliade (1907-1986) was a Romanian historian of religion who observed that for archaic man “real” objects and events are those that imitate, repeat or are patterned upon a celestial archetype. He believed that “the man who has made his choice in favor of a profane life never succeeds in completely doing away with religious behavior.” (The Sacred and the Profane) He is right. Even the most devout atheist enjoys liberties that are wrought by religious men. The tabernacle and the temple on Zion were built according to the pattern of the Horite Hebrew shrines, with east-facing entrances, pillars, water sources, and three central chambers. This should not surprise us since Moses was the son of a Horite Hebrew priest, and David was the son of shepherd-priest who lived in the Horite Hebrew settlement of Bethlehem (1 Chron. 4:4). Both are descendants of earlier Horite Hebrew ruler-priests. They were responsible for protecting and upholding the pattern that they received from their righteous ancestors. Those ancestors knew God as the Father by the names Ra and Ani. The Father's Son was known by the names Horus or Enki. 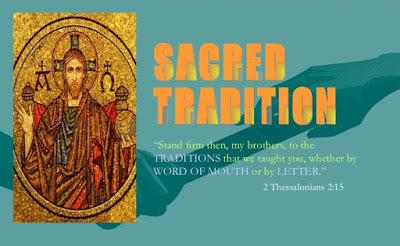 The central myth reveals the Messianic pattern by which the Apostles and subsequent generations of Christians recognize Jesus to be the Son of God, the Messiah, who came into the world to save sinners, such as me. Finally, I apologize for any inaccuracies found at JUST GENESIS. This is a work in progress. I believe it to be an important work. Please pray for me. Alice, I am still following your blog posts with great excitement and interest. However, it is hard for me to believe that the cousin bride's naming perogative is all that unique. When I first read of it in your writings, all I could think of was,"Gee, I didn't know I was a Horite." I have traced a number of my ancestral lines and almost all of the families have a son named for the mother's father. I can't really see anything Horite about it. Most of my ancesters are of Scots-Irish lineage. This pattern goes back many generations. I have also read that this naming custom was common. The naming custom also holds true in the lineages of my friends (I belong to several genealogical societies.) I would love to hear what you think of this. We have also been Christians for many generations, with many ministers of the gospel in each line. I continue to enjoy your blog and eagerly await each post. The naming of sons after the mother's father isn't unique to the Afro-Asiatic chiefs. Identifying this pattern in the Bible helps us to trace the line of descent from Kain and Seth to Jesus. That's why this information is important. I hear the terms "Hebrew", Jew, Israelite", "anti Semitic" thrown around a lot. Exactly what do those terms mean? What? How is it that you are the only one who gets the scoop on the "Who's Who" of the Genesis lineages? :) No matter how many searches I do trying to figure out stuff like Keturah's relationship to Abraham before their nuptials, I'll start reading, and glance up the url line and it's invariably jandygenesis! Don't get me wrong - I think it's great! I have cognitive, mostly neurological learning disorders and there is NO one that could get me even on the right track of things like the patrilineal-half-sister-1st cousin deal. Thank you so much for that. I'm an acataleptic, as in the philosophy that nothing can be proven (or note) to a degree of 100% certainly. We, as mere mortals, are just not qualified or even perhaps worthy of knowing such high secrets of the universe. I am agnostic, but a true believer, mostly in Nature's God and Nature's Laws, of Jeffersonian fame. A Jeffersonian Christian, if there is such a thing. He wrote his own Bible, so.... :)I kind of would like add to his philosophy that, given that we can only speak to God in our heads - and that's our voice that's talking - and considering that our brains can't just leave our cranium and go for a walk by itself to find stuff out, it seems to me that it's all about the way we humans perceive things through our own, very fallible, man-made 'lenses'. We can only try to learn, but only a higher power can know. That's just my humble opinion of course. But, from Horites, to Mt. Seir, to Mt. Horeb, to the Horus road to Horus the god, etc., you are the first person who ever made logical sense to me that there can be a priestly class, independent of any kind of ethnic or tribal ties. That makes sense! I'm so locked in to following a gazillion groups of people around and kind of get bogged down in minutiae along the way. Ugarites, Hamites, Amurru, Ameleks, Midianites, etc. - it's exhausting. Anyways, thanks for what you do. You have rekindled my love of biblical 'historicity'. My personal fascination has long been on the Hyksos conquerors of MizRaim and their relationship to Joseph, Jacob's family and Moses, etc. Here's a question: Preface: I believe that the Exodus of the Hebrews from Egypt to Midian took place perhaps 200 years earlier than other writings have it pegged. It would explain how the protectors of the Hebrews, the by-then-expelled Hyksos, got to Gaza to make a last stand, while (somewhere around there) the Hebrews slipped away across the Red Sea to Midian, to the Wilderness of Sin (mistakenly called the "Reed Sea" and "Sinai", respectively, by the Masoretes.) So - given, that Moses and the Hebrews crossed the Red Sea at the Gulf of Aqaba (while the Egyptians went to Gaza to destroy the remnants of the Hyksos), how did Moses cross the Red Sea to/from Midian the first two times (one his flight from Egypt to avoid a murder rap, and second, back to Egypt with his family to "bring his people" out?). Or, Q. #2 - why couldn't he have just gone north of and then down the Eastern side of the Gulf of Aqaba, mabye 1, 2, or all three times? It should be noted, that the massive volcanic eruption of Thera took place at that time, and would explain at least nine of the ten plagues of Moses and Aaron, PLUS explains why a (frequent in the Gulf of Aqaba - last time in 1997) tsunami would have cleared the water away, and then, wash it back in with a vengeance. Have you ever examined the Jordan Rift Valley? It was volcanically and slip-fault super-active in the 15th century BC, and could explain a lot of what happened. I agree. From the earliest times (millions of years ago) humans have had a need for an intercessor between the Creator and the individual, and the Creator and the community. This is either a priest or a shaman. These are the two oldest religious offices, but they have very different worldviews. There were women shamans, but no women served as priests. This is because the priesthood is connected to animal sacrifice and that is the blood work of males, not females. The blood work of females is to bring forth life, not take life.